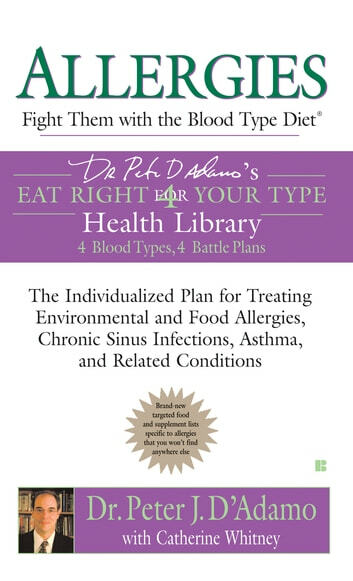 With specific tools unavailable in any other book, *Allergies: Fight Them with the Blood Type Diet *has four battle plans—individualized for your needs—for preventing and treating environmental and food allergies, chronic sinus infections, asthma, and related allergy conditions. 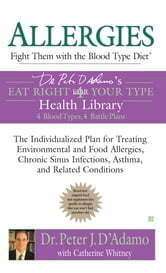 • A diet tailored to your blood type that attacks allergies at their source, reducing inflammatory activity, and pinpointing dietary factors that trigger allergic reactions. • A new category of Super Beneficials highlighting powerful allergy-fighting foods for your blood type. • Blood type-specific protocols for vitamins, supplements, and herbs to target allergies and related conditions. • A four-week plan for getting started with practical strategies for eating, exercising, and living right to fight allergies.